The Elixer! This is a multi award winning Sweet and Hot Caribbean style sauce. Winning the 2014 Screaming MiMi at the NYC Hot Sauce Expo for best fruit based hot sauce! 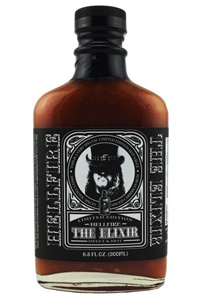 This sauce is delicious on seafood, chicken,steak and anything else you want to add some sweet heat to! Featuring Orange Habaneros, Moruga Scorpions and 7 Pot peppers to bring the heat and Mangoes, Papayas, Pineapples, Mandarin Oranges, Peaches, Caribbean spiced rum, brown sugar,vanilla, allspice, cinnamon, cloves, ginger and other spices to bring the flavor and sweetness to the mix!!! This is a must try sauce!!! It will make the ordinary taste extraordinary!!!! ALL NATURAL! Caution this may be addictive!!!! Enjoy! 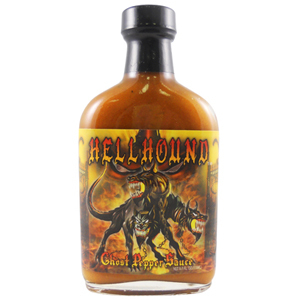 Ingredients: Distilled vinegar, mangoes, orange habanero peppers, mandarin oranges, moruga scorpion peppers, red 7 pod peppers, papaya, pineapple, spiced rum, peaches, sugar, garlic, brown sugar, allspice, vanilla extract, ginger, curry, cinnamon, cumin, cloves.